Next Wednesday I’m running the first dissemination event from the BIM Hub project. It’s a webinar organised by ELESIC and is at 12:30 GMT and can be connected to at this link http://uni-of-nottingham.adobeconnect.com/elesig. BIM Hub is the project I’m working on at Loughborough University, the project website is at http://bim-hub.lboro.ac.uk/ . It’s a good time to be starting the dissemination because we’re getting to the point of not only having got lots of good data, but have been able to carry out the analysis of some of it. To give you the story so far, BIM Hub links together students from three universities; Loughborough and Coventry in the UK and Ryerson in Canada. It also links together students from a variety of disciplines, but overall these are architecture, construction engineering and project management. The idea is that the students are given the task of designing a building to fit into a particular piece of land around Coventry, they have to come up with three concepts for the client (their tutors) and then have to go ahead and design something for the concept that’s chosen. The project is funded by the HEA and is a continuation of a previous one funded by the Hewlett Packard Catalyst program. We’re planning to capture lots of different data sets, focus groups with students, surveys that they fill in, and analysis of some of the recordings of their interactions in GoToMeeting (which is the videoconferencing tool they are using). Some of the things that have come out so far corroborate what we’ve seen before. Trust seems to be the most important component of a successful interaction. Failure to fulfil obligations as far as passing on contributions by agreed deadlines seems to be the biggest factor in undermining trust, and as we saw before with the HP project, that’s where the distanced nature of the project comes into play; it seems to be far more difficult to rebuild trust in a distanced environment than it is in a face to face one. There were advantages to working across institutions however. The students felt it was a more authentic simulation of an actual working activity. Since in the face-to-face situations they tend to work with friends, working inter-institutionally meant that they had to present a professional persona to people who they did not know, and represent their institution to others. However, quite a few (about half) complained that working across screens was not as engaging as f2f and claimed that in a working situation they would still meet others at least once. Part of the problem with lack of engagement appeared to be (when watching the videos of the meetings) the very limited social presence that the students presented online. The meetings did not start off with any pleasantries, the students only saw each others video in brief glimpses when they were switching between windows. Interactions took place for long periods of time in audio only. Where students did make their presence felt was in the way they interacting with the diagrams on the screen. 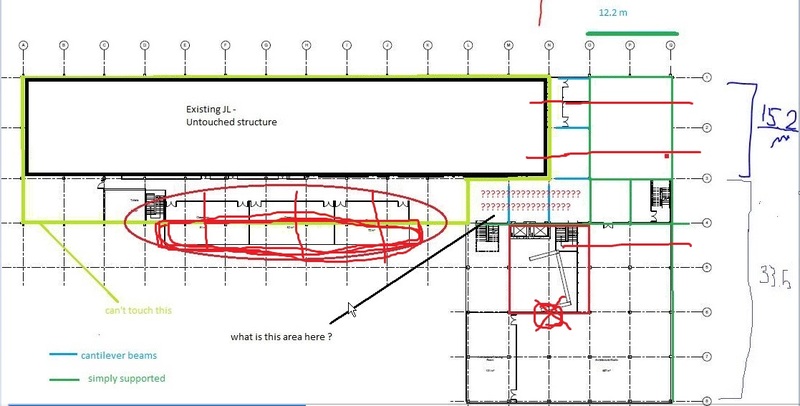 As you can see in the image above, the students were drawing on the plans in real time, what you need the video to see is how the scribbling was used to emphasise, clarify and draw attention to, specific parts of the image that were the centre of discussion. This wasn’t a skill that the students started with, in other videos you can see them trying to describe stuff orally, then give up and use the images from plans, gradually learning to express themselves at a distance. In very early videos, the students mumble and aimlessly flick through paper plans – separated from each other in their own rooms, and failing to bridge the distance between them. Other skills we see develop across the videos are basic elements of structuring meetings, using agendas, clarifying action points, timing the discussions. The focus groups confirm this: the students state that one of the most important things they learnt from the exercise was the importance of things such as minutes and agendas in ensuring meetings went smoothly – the generic collaboration skills are being discovered as much as the skills specific to online working. What was impressive was the fluidity and competency with which the students moved between different technologies. Dropbox was used for organising and sharing documents, GoToMeeting for synchronous communication, emails for correspondence and Facebook for clarifying communications and organising meetings. It was only the one or two groups who crossed these demarcations (eg using FB to share documents ) that ran into confusion, although all had tech problems with the hardware needed to run GTM, and all had software incompatibility problems. They also got over all the cultural/language problems. For example, every time a floor was mentioned it was accompanied by “first for us, second for you” and so on. All seemed to struggle with timezone issues, particularly in the week between UK clocks going back and Canadian clocks going back. North American candy companies have a lot to answer for. The ease of use of the technology, the development of social presence, the application of project management and time management techniques all seem to develop in concert with each other. One of the hypotheses we’re exploring is that these things are interdependent; for effective collaboration online all of these factors need to be exhibited – and we won’t see competent project management techniques without a correlating development of online presence. The question then becomes; how much of these skills that the students learn can we pre-empt by just telling them this stuff at the start? Experience in staff development tells me that there’s no point telling people in advance, they don’t really listen until things go wrong. But maybe students would be more mature about paying attention than staff are.